An Oxfam program supplies female farmers with the tools to manage their crops and to redistribute power in their households. Yet, 12 months later, she’s changed her tune. Lucia grins from ear to ear as she shows off Malual—the young bull that tills her land. Women in Lucia’s community—as in most parts of South Sudan—typically shoulder a huge workload. They do all the domestic work and much of the agricultural tasks. For many, this means waking up early to collect water, light a fire, make tea, and cook lunch, all before heading to a small plot of land to cultivate crops. Farming often takes from morning to evening, and even then, doesn't always provide enough food to feed the family. This was Lucia’s experience until last year. That’s where Malual come in. Traditionally, people in Lucia's community use malodas—small tools with a sickle-shaped head—to till the land, but because the tools are so small, it takes a long time to work the land. 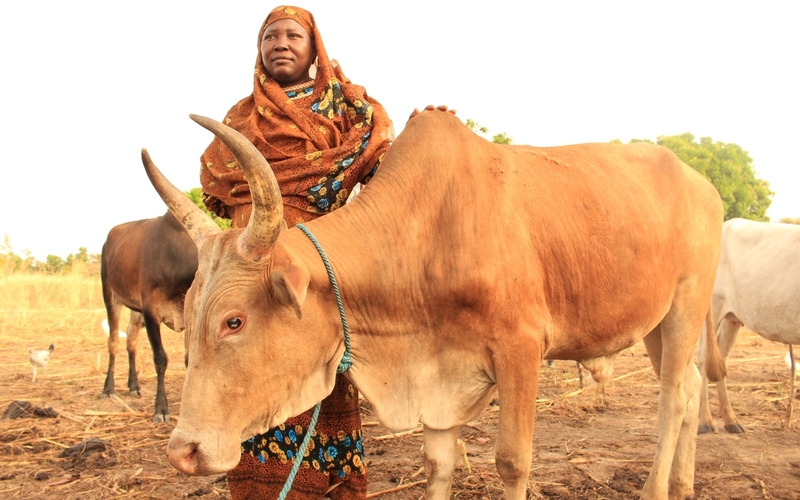 Using oxen and employing techniques like planting in rows means women can cultivate much larger plots of land in less time. In the past, Lucia and her family skipped lunch because they only had enough food to stretch between breakfast and dinner. “My children are much happier and I can see they are looking well,” she says. Lucia is earning enough money to pay some bills, and the time she's saved using oxen is going into a side business selling cakes—all of which has earned her the deep respect of her husband.